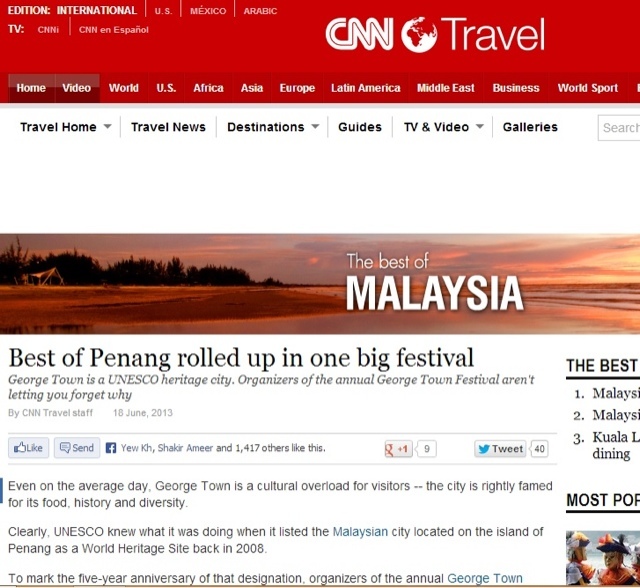 CNN Travel has recently published an article telling readers why now is the best time to visit Penang. Covering some programs from George Town Festival and also the Penang Durian Festival, the article also mentioned of George Town’s status as a UNESCO World Heritage Site and the city’s richness in culture, history, diversity and delicious street food. One of the highlights of the article includes the Theatre of Ships, a bamboo sculpture built by Indonesian artist, Joko Dwi Avianto and situated at Esplanade between the Penang Town Hall and the city hall. The Obscura Photography Festival is also highlighted here together with ‘Sutra’, a theatrical dance work “inspired by and starring the famed Buddhist Shaolin monks”. Sutra features 17 monks from the original Shaolin Temple in China and includes a live orchestra who will perform a new score for piano, percussion and strings by Polish composer, Szymon Brzóska. Next in the article are the Secrets of Unearthly Delights, a series of gardens around George Town which is created to form a public trail, and the George Town Heritage Celebration from July 5-7. Finally, the Penang Durian Festival held at Anjung Indah, Balik Pulau has been ongoing from 1 June and will continue until 31 July, from 11am till 6pm daily. This is the best time for durians as it is the durian season in Penang so expect a variety of durians for sale at the fair including the “ang he” and “hor lor” variants.